It felt good to do a layout that wasn't for my club workshop. My son got to make his first gingerbread house a couple of weeks ago. He had a lot of fun decorating it. He's also been enjoying the fruits of his labours since then, with the house all disasembled, pieces sitting in a ziploc, mostly eaten now. I had printed out quite a few pics and wanted to use them all, so I ended up with the journaling hiding in behind the hinged photo. Supplies used (all CTMH unless otherwise noted): Veranda, Creative Basics Veranda, Jingle B&Ts; Colonial White, Bamboo, Brown Bag CS; Posterboard Alpha, Tiny Typewriter Alpha, Save the Date stamps; Chocolate, Black, Brown Bag inks; Love Letters Chocolate Rub-ons; Colonial white circle metal tag; Chocolate, Cranberry, Colonial White, Garden Green brads; Filigree charm; Olive felt tree; Pewter hinges; Chocolate ribbon; Loop edge punch (Martha Stewart); Tab punch (McGill); Make-up sponge (other). 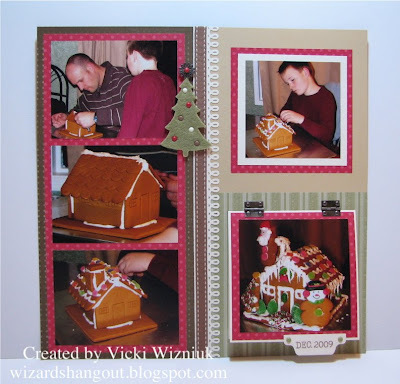 Great layout Vicki! That is (or should I say that WAS) a wonderful looking gingerbread house. My boys have never done one and I had every intention of doing it this year, but time's a tickin' and still no house. Oh well, hopefully next year. Have a Merry Christmas! THat gingerbread house is just awesome!!! I bet he was proud. Looks like your son had a great time Vicki. 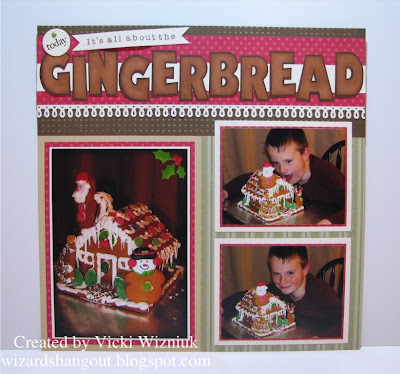 The Ginger house is beautiful and so is your layout! It feels so good to complete layouts for our own personal use - I agree. 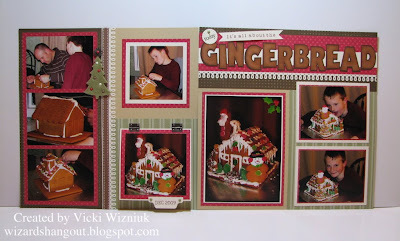 That's a YUMMY lookin' Gingerbread House! We made one, too! I need to post our pics!!! I love the layout! I have a question. How did you make the "Gingerbread" letters? They look like real gingerbread!